Well, I am nothing if not a trier! Here I am in the Diesel Ronhar bootcuts again (one of my three pairs), bought about 4 or 5 years ago. And have been languishing while I frolicked and pootled and played (any other mothers of young children reading?) in skinnies. 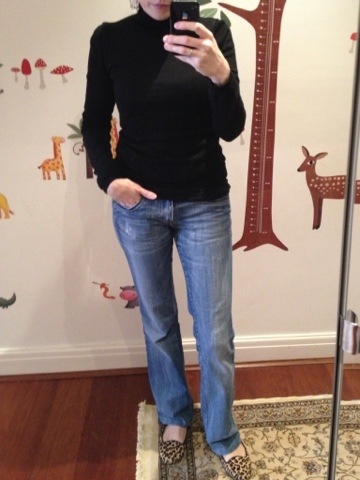 And now, while I still love a skinny jean or two, I want some variety. So out came the old bootcuts again. I tried them with flip flops, and with the right top, I like them. I tried them with slipper flats, and, to my eyes, its not a good look. I think because, with bootcuts, I prefer it if you can see either all foot (a la flip flops), or all shoe. So I have tried them again with pointy heeled boots, and the pointy boots have scored. Its a combo that works for me. Today’s outfit: Massimo Dutti green, black and cream scarf, Uniqlo black roll neck wool jumper, Uniqlo cream heattech thermal top, Nine West pointy heeled boots. 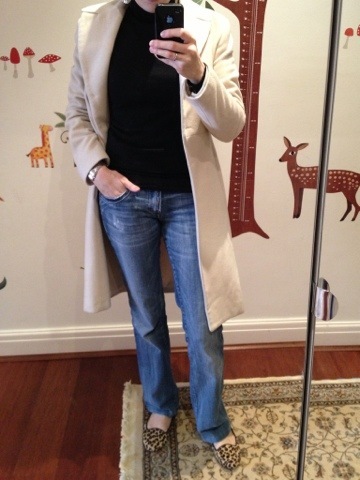 This entry was posted in Outfits and tagged Cos, Diesel, Massimo Dutti, Nine West, Uniqlo on March 13, 2013 by Belinda WornOut. Aha! 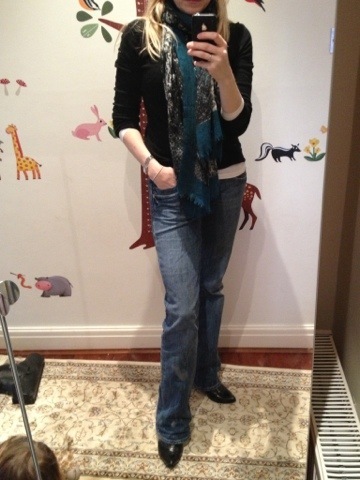 Found the Diesel Ronhar jeans, and I am wearing them today with a beige coat (old from Sydney), a Uniqlo black wool roll neck and Office ponyskin leopard slippers. What do you think? I am not sure – I think I prefer them with a boatneck and flip flops, like I wore the other day. It has also been years since I have worn them, so I am also unaccustomed to how they look. I will keep on trying and playing around – the joy of a large wardrobe (aka one that needs decluttering!!) is the fun you can have with the different options available, no? Also, I have some TopShop Marthas, also from a few years ago, so will see how they look slightly rolled up – a gentle introduction / good alternative to boyfriend jeans, perhaps? 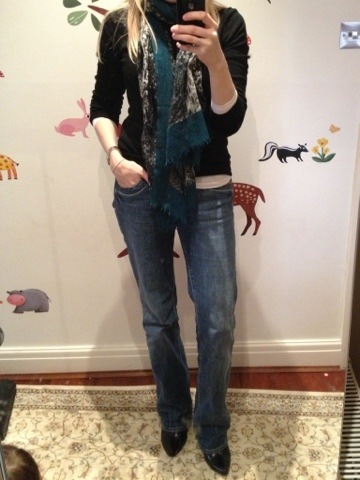 This entry was posted in Outfits and tagged Diesel, Office, Uniqlo on March 4, 2013 by Belinda WornOut.